This Wednesday may well prove to have been the last day of summer here in London. Bright sunshine, 24 degrees and plenty of bright young things flitting about Somerset House – one of the settings for London Fashion Week. 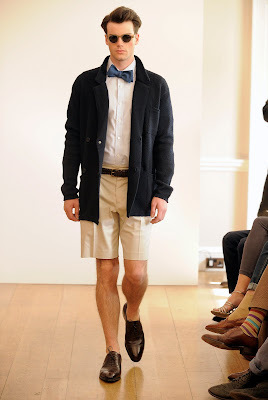 I like dipping into this world of fashion, going to a few shows at the now dedicated menswear day every season. It’s a close, frantic body of gossip and movement, punctuated by the odd string of models strutting to music. It would be funny if it wasn’t so serious. Few shows suit the aesthetic of Permanent Style, but one that does is E Tautz, both in terms of style and craft. Patrick Grant followed up last year’s success, co-hosted by Hardy Amies and Gieves & Hawkes, with his own show this year in the Navy board rooms overlooking Somerset House’s central square. A Tautz collection tends to be driven by a few ideas in cloth and one or two in shape. This season (for Spring/Summer 2011) the cloths were fresco, wool/silk mixes and slub silks – which emphasise the points at which strands of silk join, to form a knobby surface. The shapes were double-breasted jackets, cut with large lapels with plenty of belly and roped shoulders, and slim trousers cut very short. 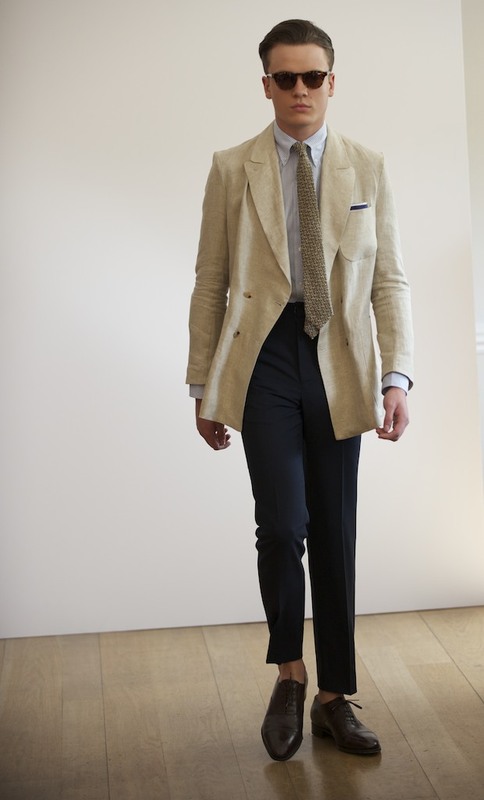 I loved the use of fresco, in particular the various weights, from 9oz in the trousers to 14oz in the trench coats. As Patrick admitted, much of this collection will drop into Harrod’s and elsewhere in December, so there had to be a few weightier pieces. Another was a Harrington jacket in lambswool, featuring a nice central pleat in the back. The shape of the double-breasted jackets worked well when worn casually and undone, something reflected in the knitted wool version. 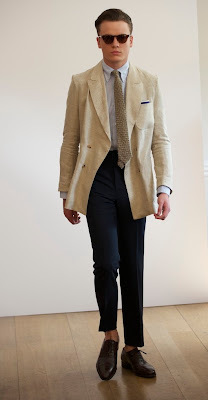 When unbuttoned, the strong shoulder and big lapel helped to retain some shape. It’s a look that would work less well in a suit. Colour use was lovely. A chocolate hopsack jacket; RAF blue fresco trousers; dark olive slub silk tie worn under ivory cotton and cashmere sweater. 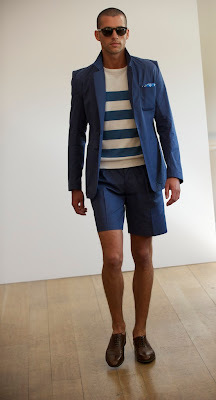 The shape generally of the trousers and shorts does not appeal but they are definitely aimed at a market different to mine – a Modish and rather schoolboy look that Patrick described as “Molesworth meets Monty”. You can follow the discussion on E Tautz at London Fashion Week by entering your email address in the box below. You will then receive an email every time a new comment is added. These will also contain a link to a page where you can stop the alerts, and remove all of your related data from the site. Congrats on your recent award. Would it be indiscreet to inquire whether prices are mentioned at fashion shows? If so, what are the price ranges on the items shown? Hi Stephen – they are not, but you can find out prices on Tautz fairly easily at Matches, Harrod’s or Barney’s, where they are stocked. 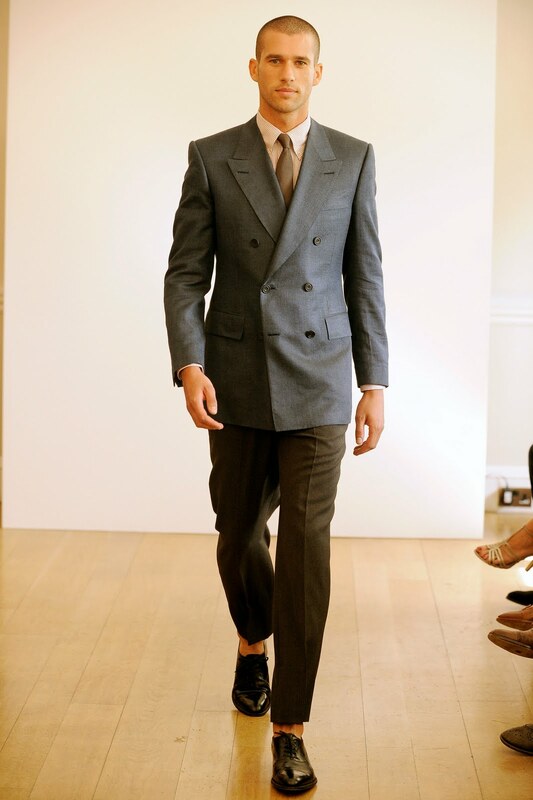 They vary from very reasonable ties (£95) to very expensive suits (£2500) that are made by hand at Norton’s. And there’s a lot in between. 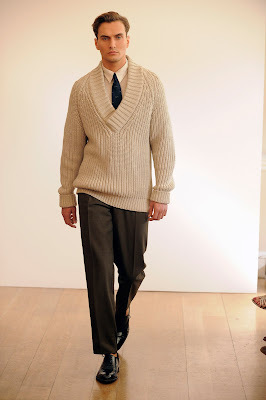 I’m not very much ‘au courant’ with the pecuniary compensation for male fashion models, but shurely they’d be able to afford socks?